Our unique combination of carefully selected color enhancing ingredients including Spirulina, Marigold, Astaxanthin and Phaffia Dried Yeast offers extreme color enhancing capacity not previously available. More rapid color with deeper hues can be expected when compared to other color enhancing foods, even Saki Hikari Goldfish Color Enhancing Diet. The Hikari-Germ promotes more rapid digestion thereby reducing output while working to decompose waste thereby improving overall water quality, filter effectiveness and helps reduce regularly scheduled maintenance. Higher levels of vitamin E and C offer active stress reduction and thereby improved immunity to stress induced disease. 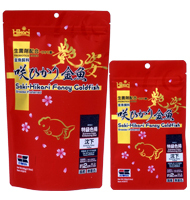 Our Lab tests verified feeding using as little as 25% Saki-Hikari Fancy Goldfish Extreme Color Enhancing Diet still offers superior color development. Note, exclusive feeding may cause acceptance issues and/or reduced growth due to the focus on color enhancement.